Emily: I was wondering if you know if your son had any enemies. Hank: You mean other than the thousands of Iraqi and foreign fighters who've been trying to kill him up until a couple months ago? While it took several years after the Vietnam war for movies to address the issues that arose from that conflict, including the stresses upon soldiers returning home, there hasn't been any such grace period for the war in Iraq. In one sense, that's problematic, since it's difficult to get a perspective in the moment, but on the other hand, it's also commendable for artists to make a statement while there is still something that can be done. In the Valley of Elah takes the true story of the murder of Private Richard Davis and uses it as a basis for questioning what we're doing in this conflict and what we are doing to our young men and women in uniform. Ex-MP Hank Deerfield (Oscar-nominated Tommy Lee Jones) gets a midnight call that his son Mike, just returned from Iraq, has gone AWOL. Determined to find Mike before he gets himself into deep trouble, Hank heads for Fort Rudd, where he is stymied by military and police bureaucracy and a conspiracy of silence. But when Mike's body turns up dismembered and burned, Hank's mission takes on a new determination. Working with the grudging acceptance of Detective Emily Sanders (Charlize Theron), Hank tries to unravel what happened to his son, and who was responsible. In the process, he learns that the war in Iraq has taken a terrible toll on several fronts, on the psyches and the souls of the soldiers who are doing America's dirty work. Jones carries the drama on his back and craggy face, and he does a superb job with it as he tracks a revolution in a man going from proud soldier to worried father to angry father and finally to recognition of the horrors that lie within others and himself. His dry delivery works well for the tired old man, dripping with sarcasm and occasionally driven to moments of outrage and fury. Theron more than keeps up with him as the long-suffering Emily, who deals with incessant sexual harassment and general sexism both on the job and dealing with the military. She does a fine slow burn, as she knows her skills are superior to those mocking her, and she's incredibly touching as she comes to terms with her failures in dealing with a case that lead to fatal tragedy. Susan Sarandon, as Hank's wife Joanie, doesn't get much to do other than fret, although she does get an excellent scene with Jones about what trust means to the two of them, and how that trust may have been badly misplaced. Writer/producer/director Paul Haggis gives this picture a ton of layering, with a number of issues dealt with from varying perspectives, and with shades of humanity and inhumanity colored in a way to give a feeling of truth in their depiction. The script is sympathetic to the Iraq veterans, even while pointing up the wreckage war makes of their lives. The gender issues are dealt with humorously and seriously, and while the relationship between Hank and Emily is both necessarily close and difficult, it never stoops to the Hollywood tactic of conjuring up a romance between them; their interplay is far more complicated. Racism also rears its ugly head when Hank jumps to conclusions about who murdered his son, flying into a violent rampage against a Hispanic soldier who may or may not have had a role in getting Mike involved in the drug trade. At the same time, Haggis keeps the movie rolling along with suspense that's generated from the story and not from artificial chases or similar tomfoolery. It's serious stuff, and seriously approached on every level. The picture takes its title from the Biblical tale of David and Goliath, and the metaphor works on a number of levels. To Hank it represents the honor of the soldier against impossible odds and facing your fears to do your duty. To Emily and her young son, it means old men determining to go to war but being afraid to fight themselves and instead sending boys in to do deadly combat. In the Valley of Elah asks some hard questions that need to be faced in the coming years, and unlike the sanitized versions of the war displayed by the mainstream media, it doesn't flinch from the often horrific face of war on the ground and what it does to the people who fight it. To this picture, while Iraq is acting as a breeding ground for terrorists who inevitably will develop a lifelong hatred for America, these same conditions produce a situation that can generate problems amongst vulnerable soldiers, who will be unable to find a place for themselves back home. While the picture doesn't have any solutions, it deals with the situation with respect and as gripping entertainment, a social drama in the tradition of Les Miserables. Image Transfer Review: The combo DVD offers an attractive VC-1 encode that is pretty clear and maintains good grain structure without being flickery. Color is quite natural and not overpumped as is so often the case on HD media. The sequence of the story of David and Goliath, shot in low light, looks overly processed, with some detail lost to noise reduction and covered over by sloppy edge enhancement. That's the only seriously problematic sequence I noted, however. Audio Transfer Review: The audio is appropriately clean throughout. There is a TrueHD English language track that offers a little better depth and spatial awareness than the 5.1 DD+ track, but both are quite acceptable. Mark Isham's tastefully minimal score sounds good, with fine range. Extras Review: All of the extras are presented in HD. A pair of documentaries cover the making of the film (27m:39s) and the implications of post-traumatic stress disorder (15m:23s) in the story and in real life. The making-of is first-rate, with plenty of interesting behind-the-scenes footage, including Haggis getting the soldiers to feel as if they're a unit. There's an interesting sequence of Jones disagreeing with Haggis' interpretation of Hank, and eventually conceding that it's Haggis' picture and that he'll play it how he wants. Perhaps the most fascinating bit is a chat with some of the exotic dancer extras, who relate their own experiences with returning Iraq vets and PTSD. The other extra is a deleted plot thread (7m:51s) that consists of several scenes of Hank tracking down Mike's girlfriend, "Jennifer Lopez." This segment also includes some green-screen footage showing how the loss of several of her limbs was accomplished on film. 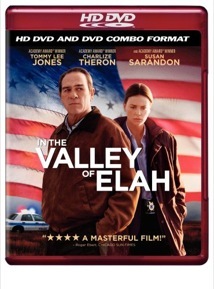 A tightly-crafted drama of social issues wrapped in a murder mystery, In the Valley of Elah offers some excellent lead performances and psychological complexity to make it the first true classic to come out of the Iraq war. Very highly recommended on all counts.